Arrested in 2008 for allegedly peddling Barack Obama's vacated senate seat, though without Obama's knowledge. Furthermore, the complaint alleges that Blagojevich attempted to use state funds to force the firing of editorial board members of the Chicago Tribune, predicating the removal of members critical of the Governor before financial assistance would be provided for Wrigley Field. 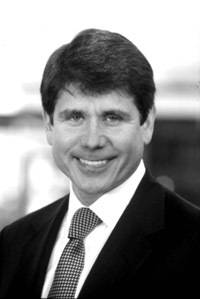 Blagojevich was unanimously impeached by the Illinois State Senate on January 29, 2009, summarily removed from office, and eventually convicted on 17 of 20 counts of corruption. He is currently serving a 14-year sentence at Federal Correctional Institution (FCI) Englewood, a low-security prison outside Littleton, Colorado.